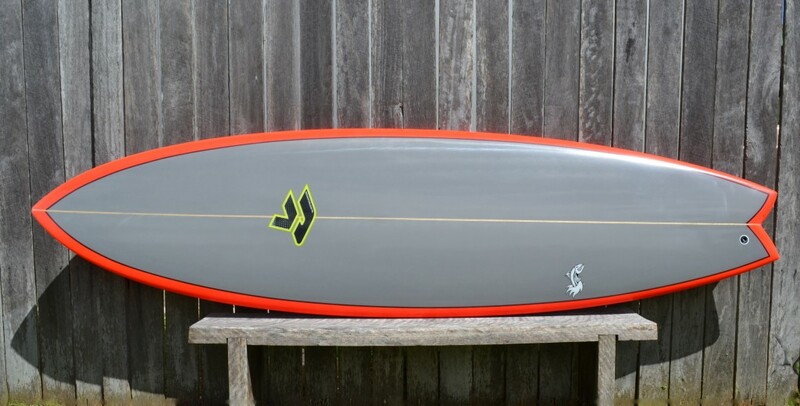 The Super Fish is like a scaled up version of the ‘Nitro Fish’ model for the big guys, with more paddle power and speed, featuring a moderately low rocker with spiral vee and very slight Double Concave in the tail. This board is a fun alternative to a mini mal or a longboard. Super Fish has extra volume under the chest and relaxed mid-entry lets you glide over the ledge easily for that first drop. The Super Fish allows comfortable turns on any part of the wave, snappy face pivots, pumps, weaves, and deep gouges. Paddles like a real big-guys-shortboard. If you are looking for a confidence inspiring board and you want a bit more float, width and something that will make getting waves just that little bit easier then the Super Fish is the one. Letting you know I am super happy with the board. Had two surfs waist to shoulder high at North Brou. General paddling is very good and paddles onto waves almost too easy. Has excellent thrust and carries speed well. Put out lots of spray on cutties etc and transitions nicely. Looking forward to some better surf and reckon it will have me jumping with joy even more. Great color too, changes with the light. Thanks for the delivering the board.